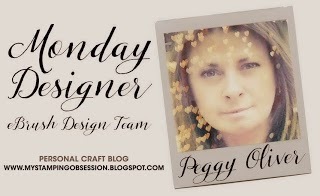 I love this sweet card from Peggy Oliver! I know that her daughter will love it! Thank you for sharing Peggy! Here it is all assembled. I used double sided tape to attach the background and foam dimensional tape to raise the sentiment . I added a ribbon bow on the bottom of the sentiment and lastly I used stickles on the stars and liquid pearls on the spaceship.